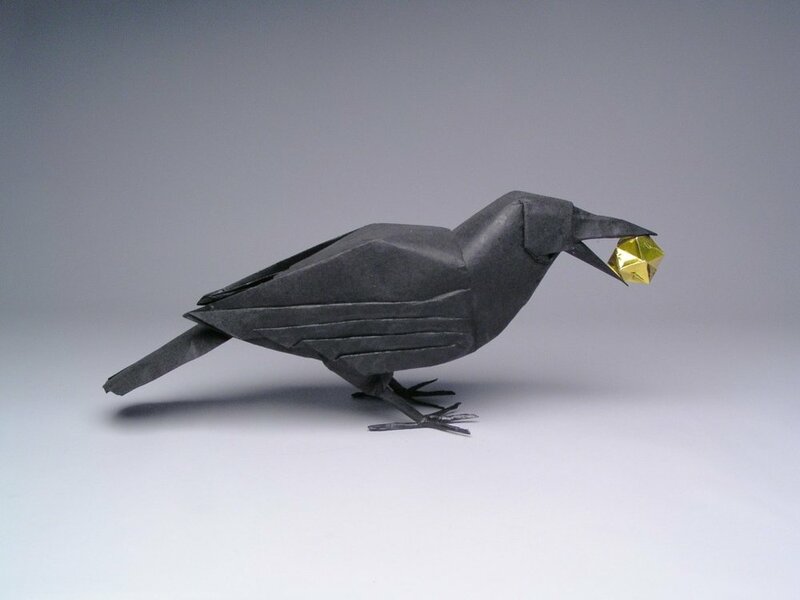 Origami by physicist Robert Lang. See note at end of post. Siobhan Roberts recently published a science piece in The New York Times, "This is the Way the Paper Crumbles. "1 Roberts wrote, "The dynamics of crumpling are in play everywhere: in the initial unfolding of an insect’s wing; in the way DNA packs into a cell nucleus, in the challenge of how best to cram a giant solar sail into a small satellite so that it unfurls successfully." Omer Gottesman, a physicist who features in Roberts' story, researched the physics of crumpling by, yes, crumpling uncounted sheets of paper, uncrumpling them, and looking for patterns. He scanned each sheet into a computer, measured and read the creases, hunted for patterns, and found that while no two crumples are alike, there was one consistent total length of creases, no matter what. This was the deterministic variable, the state variable. The complexity of a wadded up sheet of paper can be reduced to a single simple measurement. Other scientists have found consistency of folding across items and substances—tectonic plates, the human ear, fabric, cell membranes, they all fold in the same basic way. The thing about folding, in a wider context, is not just that it permits a great deal of material to occupy a confined space. (Think of your cerebrum and that you have all that brainpower folded into a container smaller than a cantaloupe.) That it permits so much information to be stored in a microscopic unit—DNA. No, the thing about folding is that it is information itself. How something folds is information. Genes provide the instructions for how proteins fold, and how those proteins fold, the information contained in the folding, determines what the protein does in your body. No folding, no protein function, no genetics. 1 Siobhan Roberts' story is here; you may well encounter a paywall. For The New Yorker, Susan Orlean wrote a great piece on physicist Robert Lang, who computes intricate patterns to create astonishing works of origami. Find it here.